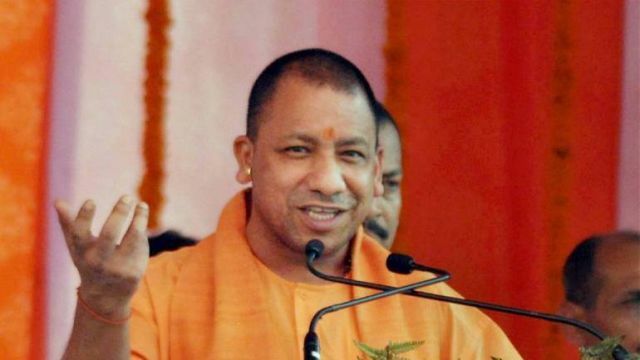 Lucknow : Uttar Pradesh Chief Minister Yogi Adityanath on Saturday said the date for construction of a grand Ram temple will be set by Lord Ram himself. He also pointed out how previous state governments were afraid of visiting the temple town of Ayodhya and added that he has visited the holy town, so that it can be developed to the level it should be. To a question on education, the Chief Minister said for years a section of the society was being deprived of modern and technical education and his government is committed to changing it. “Children of a specific section are being deprived of modern education and restricted to ‘mazhabi shiksha’ (religious education). We have decided to change it and hence we have initiated modernization of Madarsas,” Adityanath said. He also trashed the efforts of the opposition to gang up against Prime Minister Narendra Modi and the Bharatiya Janata Party (BJP) and said this “mahagathbandhan” (grand alliance) would never work as there is confusion over who would be its leader. He also refuted charges that the BJP pursues politics of caste and community and pointed out that the mantra of BJP governments was only and only development. “Welfare of the people and comprehensive development drives the BJP government,” he added. Claiming that the BJP government had rolled out several thousand jobs for the unemployed youth, Adityanath went on to say that the state government would be recruiting 1.37 lakh teachers and 1.62 lakh police personnel. Strict action against criminals has yielded good results after which investment worth crores of rupees has come to Uttar Pradesh, he added.